Tasting savory drinks on a voyage in the Stockholm archipelago, a night spent in the ancient Swedish fortress built in the 15th century, people chilling out at the legendary Absolut party just to name a few awesome moments that come to mind. The phenomenal atmosphere was par for the course for the Absolut Invite Finale which invited the world’s bartender creme-de-la-creme for a showdown. Needless to say, Slovakia was also represented by the team of Tomáš Krajčík and Martin Ďurák from the Heaven Café & Bar in Piešťany. 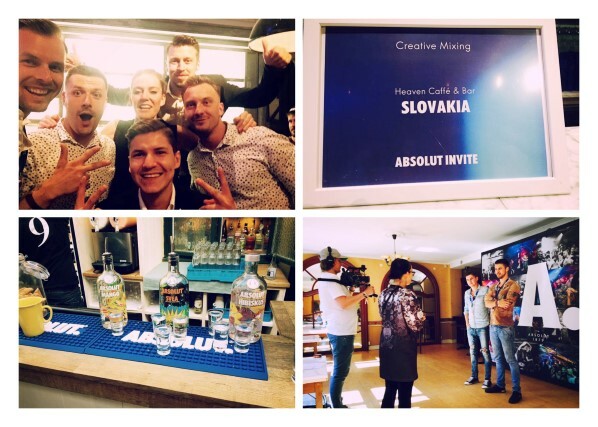 The 2016 Absolut Invite Finale took place on June 11th through 14th in Ahus, Sweden where the 13 best bartending duos of the world presented their skills. The first prize was impressive, too – a grandiose party on Ibiza. In fact all participants got rewarded by spending an unforgettable four days that yielded nothing but the best experiences. The Absolut Invite Jury comprised Absolut vodka company representatives and professionals from the world of cocktails headed up by Ben Reed, the Global Cocktail Ambassador. The jurors assessed the overall ability of the teams to create a unique drink along with kicking off an unforgettably phenomenal Absolut party. The contestants put their global cocktail knowledge to the test by literally doing a tasting test; they were supposed to define the flavors in each drink. The practical part involved assignments among teams in an effort to align with each other to mix drinks that are as similar to each other as possible; they also competed in mixing drinks within a given time limit. The final discipline involved mixing and a presentation of their own Signature Cocktail Absolut drink. The jury selected the four best teams that advanced to the Absolut After Dark Finals based on how they scored in each discipline. Sweden, Poland, Estonia, and Germany made it to the TOP 4. The showdown took place at one grandiose party. Each final team had its own premises at their disposal where they were serving their own drinks, played their own music and presented everyone a party in a unique style. The teams that didn’t make it to the finale, complemented the jury and contributed with their votes to the decision of who the final winner would become. And the first prize went to the local host, Sweden, represented by Charlotte Halsius and Johan Evers. The exceptionally unique impression of the event lied with the fact that no rivalry could be detected among teams; right to the contrary, supporting each other was present in every aspect of the competition. It was a get-together of related people with similarly positive approach who came to have a blast and chill out. “The Absolut Invite mission of turning an ordinary night into an unforgettable one was definitely accomplished and that’s undoubtedly a feather in the cap of organizers, winners as well as all contestants,” shared his opinion Viktor.